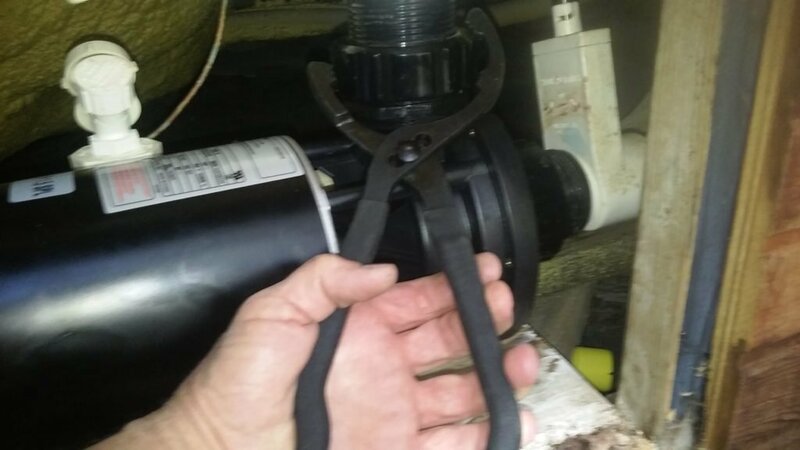 I do a lot of bathtub spa repairs, and on one particular job the pump fittings were faced away from the service ‘port’. They (pump unions) were almost impossible to get to, and definitely impossible to loosen. There was very little room to put any conventional tools – I mean, anything that would fit, would be too long to even manipulate inside that small space. For like 8 bucks. Hmmm, this looks very interesting- I like the ‘teeth’ on this sucker. The jaws are designed for circular fittings, the handles are SHORT! It’s an OIL FILTER WRENCH! I’m guessing this product is new as I cannot find it on the Harbor Freight website. I put back the channel lock set I was planning to chop up and bought this thing instead. Once I got out of the store, I got a 1.5 inch spa pump union and wrapped this thing around it. Holy COW! It grabs the outside of a pump union perfectly, the teeth on this tool are fantastic for this particular application! 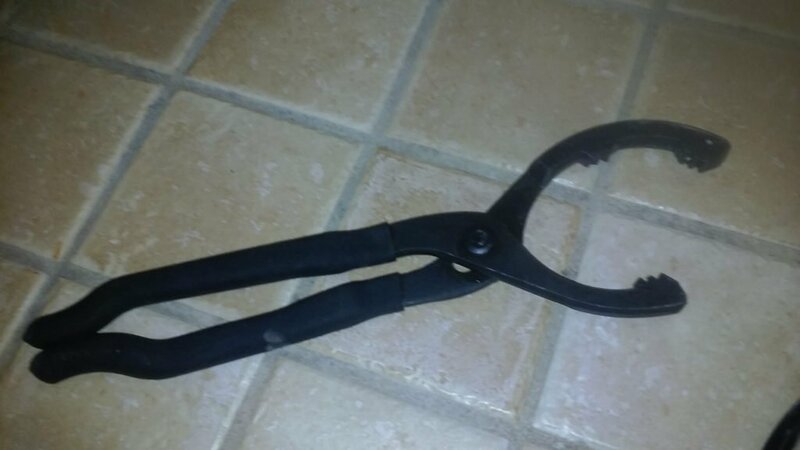 These pliers grab and loosen/tighten this fitting with very little effort. 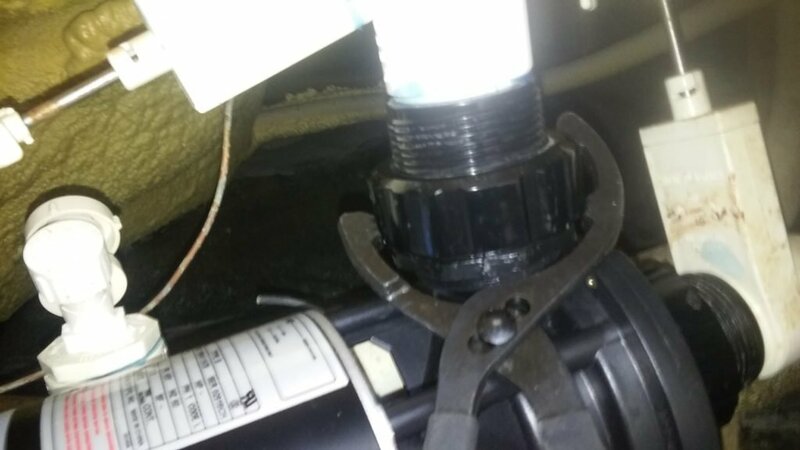 Here I’m at about 45 degree angle to the fitting and those ‘teeth’ are hanging on to the pump union perfectly. 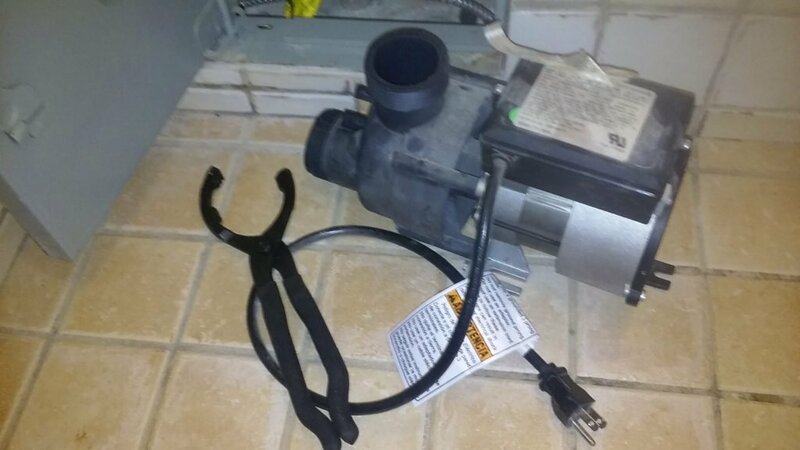 Without the ability of using this very high ‘angle of attack’ on a pump union in an extremely tight space, this bathtub would have had to been removed just to change the pump, as the left side was the outside wall of a commercial/residential building. Successful job completed. Thank you Harbor Freight! This crazy oil filter wrench is PERFECT and will forever be a mainstay in my tool box! But says the page can’t be found. So the page is on the way!